John Moore, according to Hardiman, of Bryes, Co. Mayo. Bryes Castle, near Claremorris, was the ancestral home of the Moores, but it is now in ruins and overgrown in grass. 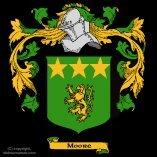 Captain John Moore of Bryes married in 1698 Mary, the daughter of Denis Daly of Carrownakelly and died in 1706. This Captain John Moore is probably the subject of Carolan's tune. ... Dónal O'Sullivan 2001 1 vol. edition p. 261.